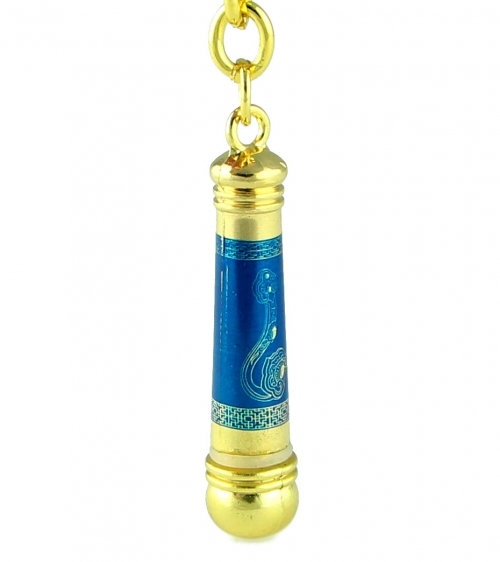 Brilliantly accomplish all your endeavors with this beautifully crafted Blue Healing Wand Amulet ! 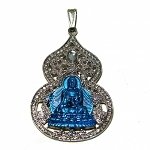 The Amulet features a ru yi and special Dharani mantras in a sea of vibrant blue (blue is a prominent color for health and healing). In 2018, the Year of the Dog, the #3 Star in the Northeast sector will bring cumbersome obstacles and hindrances. To protect yourself from the #3 Star, excel in all your activities, and strive forward with enthusiasm and determination, carry this Blue Healing Wand Amulet with you. The special Dharani mantras will ensure good health and decrease stress, worries, and pains. The Ru Yi’s majestic appearance accompanies its prominent and fascinating symbolism, and the Ru Yi is often used as a motif in Asian art. Ancient Chinese Emperors would own Ru Yi’s for prosperity and good fortune. This brilliant item is also carried by Luk – one of the three-star deities Fuk Luk Sau – and stands for opulence and wealth. Also known as the scepter of power, the Ru Yi is one of the most powerful symbols of power, authority, leadership, and prosperity. The Ru Yi’s beautiful appearance and splendid symbolism makes it a perfect gift for CEO’s, managers, business leaders, and just about everyone who wishes for leadership and authority. The Ru Yi contains a special kind of Chi that boosts one's career prosperity, positive reputation, and good fortune in business. The overall length of the amulet is approx. 4.75". It is made of alloy.